How We Got Here. Foodinis. Growing up in the 70's with Scottish parents, boiled meat, processed cheese food and canned veggies doesn't seem like the ideal seedbed for a young culinary mind to sprout. Look deeper though, and it's possibly just the right incentive needed to grow these gastronimical roots. Rewind 30 years and find young John home from elementary school and looking forward to, not kickball or tag with his friends, but watching "The Galloping Gourmet" or "Julia Childs" preparing something special from scratch. No can openers, microwaves or cheese from a tube. Just real, honest food with classic methods of preparation. Of course, he didn't really know what he was watching, but he knew he loved it! One of John's first culinary creations at the age of 8 was to put pickled beets on his tuba fish sandwich. Yup! That's where it all began. Fast forward to 1984 and John, now age 14, scored his first real food services job working working as a dishwasher as Woodstock Pizza. One year later he was making the pizza dough and sauce and by 1986 he landed his first head lunch cook position in a small bistro. 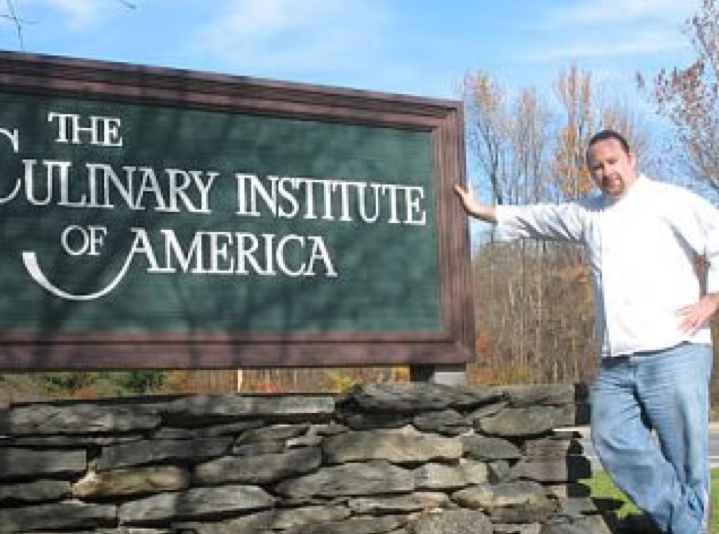 in 1994, several restaurants ( and 8 years later), John attended the prestigious Culinary Institute of America and graduated with honors. He then set sail on a small cruise ship as a Sous Chef traveling throughout South America and the Coastal US. Upon completion of his sailing stint, the young chef set ground in NJ and worked at two of the top rated restaurants in Monmouth County. By 1999 John was looking for something different. Seventy hour work weeks, holidays and weekends were getting old. So, Foodini’s Personal Chef Service was born! Contestant on Food Network's "CHOPPED" and "Taste Test"
We use the freshest possible hand picked ingredients and pride ourselves on integrity & passion. Our standards are very high in Foodini's Kitchen. Chef Deatcher has traveled extensively throughout South America, Europe,and the USA, gaining invaluable culinary knowledge and inspiration. John's dedication and gastronomic skills are evident in his worldly flavors which have no culinary boundaries.